Canon zoom lens; photo credit: Morguefiles; Rachel (right) with her friend Sara experimenting with make-up and photography with the help of a bottle of wine (or two?) and some props (photo credit: Rachel Kanev). With my Jewish nose, Bulgarian skin and English accent, I at once belong to British, East German, Bulgarian, Jewish, French and Chinese cultures and yet to none of them at all. Her grandmother, by contrast, lived in Berlin for decades but was more English than Tetley tea. Hi, Rachel. I’m pleased your globe-drifting has taken you to the shores of the Displaced Nation, which gives us the opportunity to discuss your photo-travel experiences. For one so young you’ve travelled a fair bit, but where were you actually born? I was born in my mother’s hometown of Berlin, at the traffic lights on the way to hospital. My mother said I looked like a hedgehog that day, and my family still calls me Igel (“Hedgehog” in German). A few months later, the Berlin Wall came down and one year after that, we all moved to England. So you were a Third Culture Kid in Britain. When did you spread your wings to start travelling? My nursery and primary school classes were filled with international children. Eugenia—a Spanish girl from Madrid with long black hair and a passion for witchcraft and the Greek goddess Athena—soon became my best friend. In the momentary way that often strikes a child, I was devastated when she left me to return home for good. So, at the tender age of nine, I boarded a plane alone, in my size 1 shoes, to visit Eugenia in Spain. As I began my first solo journey, I experienced a thirst for discovery, which, as yet, has not been quenched. Since that first adventure, I have visited Italy, Holland, France, Austria, Switzerland, Réunion Island and China. I plan to step (in my now size 5 shoes) into Morocco and perhaps Israel this coming summer. What do you love so much about travel? I love travel because everything is new and unknown; we share no past and perhaps no future with the things we see and people we meet. The errant wanderer therefore has no choice but to revel in the present. Despite your age, I think I can put you in the category of seasoned traveller. Tell me, what inspires your decision to travel to particular places? My inspiration comes partly from a love of languages and partly from the idealistic images of France I painted in my head when watching French films and listening to French music, which I did while revising for my exams at university. Aided by the amazing Erasmus, that towering figure of the Renaissance, I had taken a university year abroad in the island paradise of Réunion, near Africa. It’s a French overseas department so qualifies for the European Union’s Erasmus Programme, which finances students to spend up to a year of their university courses in a university in another European country. But it wasn’t until after finishing university that I had a chance to visit France itself. I meandered through southern French villages like an aimless hippie, reveling in its rural chic. I understand you also have a passion for China? Chinese was my third language at university. After graduating, I remained in England saving pennies as a waitress to finance spending a year in the land of silk. I lived in a city about an hour from Beijing. I’m curious: where are you right now and what are you up to? Right now I’m back living in my English hometown of Cambridge, selling nutritional products to vitamin-mad French and German customers—and saving up for my next Chinese/Moroccan/Spanish/Israeli adventure this summer. As I look out of the window, I am visualizing being there already, far from the Land of Vitamins C and D! No use crying over spilled wine! 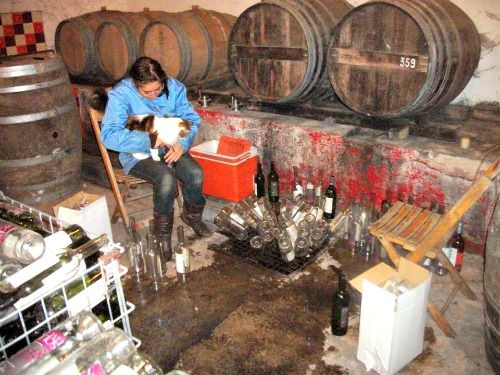 Rachel in the cellar of a now-defunct winery near Perpignan, France; photo credit: Rachel Kanev. Hmmm… I think I detect something of the entrepreneur in you, alongside your intrepid traveller’s spirit! And now let’s have a look at a few of your favorite photos from your travels to France and China. 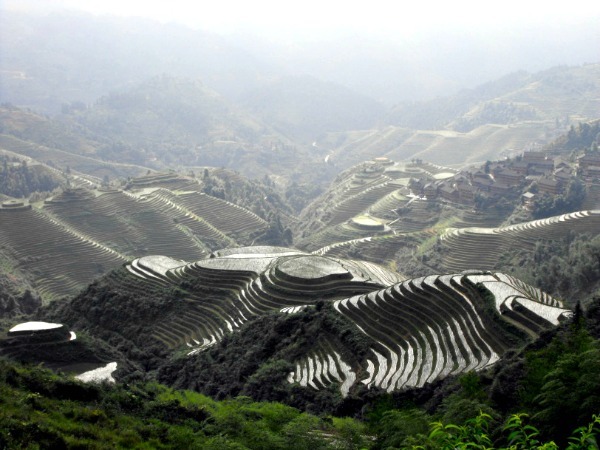 China’s Longji (Dragon’s Backbone) Terraced Rice Fields are so named because of their resemblance to a dragon’s scales; photo credit: Rachel Kanev. The next photo provides a glimpse of the glorious Dragon rice terraces of Longshen, in China’s Guangxi province. Amazing terraces stretch as far as the eye can see. I visited some years ago and remember being in awe at the combination of nature’s beauty and the skillfulness of the human hand. I had quite an adventure ambling through the fields with two of my Chinese friends. We got lost and at one point envisaged spending a cold night cuddled up to the cows. In the end we reached our hostel, at the top of the terraces, by nightfall. I returned again last year and was saddened to see that the beauty of the fields has been marred by the greedy hand of tourism. Huge plastic cable cars now transport visitors to the top, and the local villagers are paid to dress in traditional clothes. A French farmer, another Barnard; photo credit: Rachel Kanev. Last in this series we have another Bernard who stumbled into my traveller’s path. This Bernard is an 80-year-old farmer with whom I lived on my own for a week. 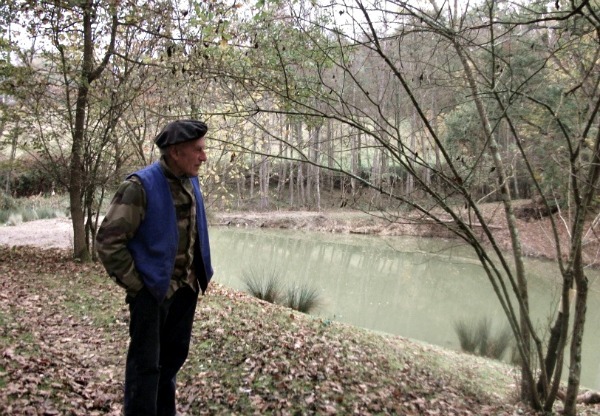 His farm is an hour away from the nearest town and is completely self-sufficient. He grows his own organic vegetables and was fit enough to hack up the ground with a pickaxe when the underwater pipes burst (ironically, I had left the home of Bernard number 1 because his pipes had burst and the water system needed to be repaired, only to be faced with more burst pipes at the home of Bernard number 2!). I love the first photo just because it looks as though you’ve broken into someone’s cellar and are drinking all the wine!! The dragon terraces appear so surreal to me because they are so different to the flat rice fields of Thailand, where I live. I wish I could see them one day. I know you take a lot of photos and these next four, I believe, have a special significance for you. Can you explain? The following is a photo I took of a photo of Bernard number 2, which was taken some fifty years ago, when his newly polished army boots took their very first steps away from the small village on the outskirts of the Pyrenees, where he was born. He bid farewell to the farm he’d grown up on and to the parents who’d raised both him and the thriving trees and crops that had formed the backdrop to his childhood. By the time I encountered Bernard, nature had outlived his parents but their legacy remained. He is now a beekeeper and organic vegetable farmer, tending to the very same trees and plants that his father and his father’s father had cared for. Though he has no human family, the trees you see in my other photo of Bernard (above) appear to me to be his forefathers; they are equally his children. 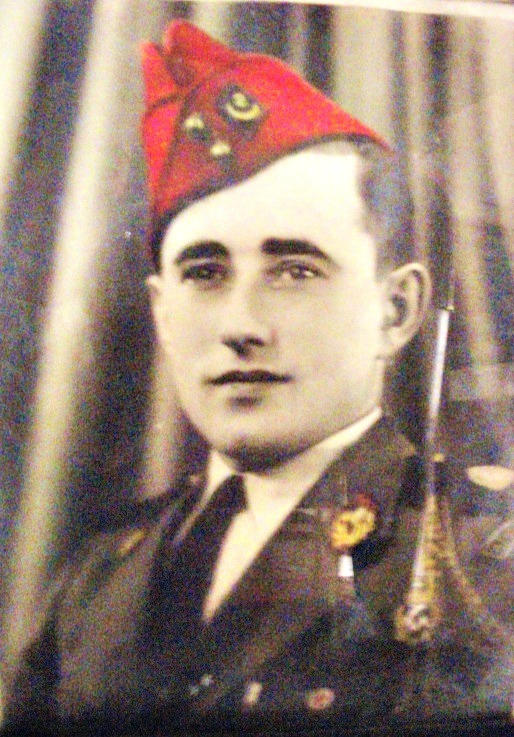 The French farmer Bernard as a young soldier; photo credit: Rachel Kanev. The next photo was a fluke as I managed to capture an ad for Longines watches showing Kate Winslet just as the sun was setting. In that fleeting instant, one can see Shanghai’s varied transportation, high-rise buildings and red lanterns—that curious amalgamation of Western modernity and Chinese traditionalism that is everywhere around you in the city. A British beauty, a Swiss watch and a Shanghai sunset; photo credit: Rachel Kanev. Cambridge is my home town and I think of it much like a family member, having watched it age and evolve just as it has silently witnessed me grow and change. I love its grandiose architecture, endless greenery, and the way winter and spring intertwine in front of the University’s palace-like structures that are fit for if not a queen then the rulers of academia, to which I never belonged. 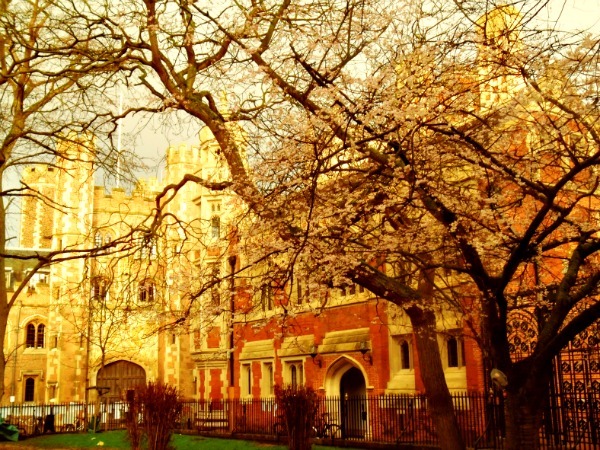 The dreaming spires of Cambridge; photo credit: Rachel Kanev. 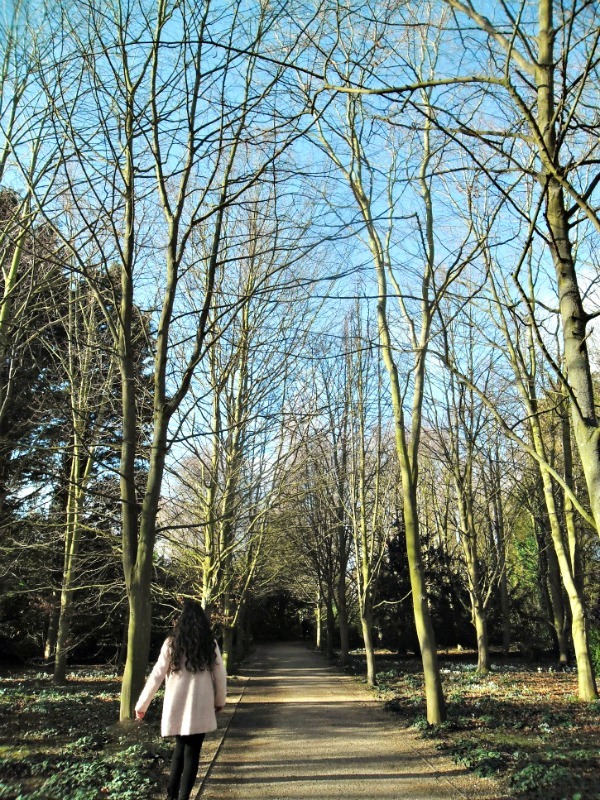 Here my sister explores the labyrinth-like forestry of a park near where we live in Cambridge. It has amazing multi-coloured plants I have never seen anywhere else before and huge trees that watch over you like silent giants. I like this photo because she looks like Alice in Wonderland with her long, thick flowing locks! The great outdoors near Cambridge, UK; photo credit: Rachel Kanev. Is photography sometimes a moral decision? I love your explanations as they show us the profound effects a picture can have on its creator, something the viewer can never fully appreciate. Tell me, do you ever feel reserved about taking photos of people, particularly when they are conscious that you are doing so? For me, the morality of taking photos of strangers has always been ambiguous. I think of it whenever I see photos of human suffering. I believe I have the right to use my camera to record the world but without intruding on it. At what point does the power of images and the need for education and understanding through the push of a button and flash of a light become intrusive and affect the lives of others in a negative way? I’ll give you an example from my own experience. The Western media has focused almost exclusively on China’s explosive economic growth when in fact 1.6 million people (11.8 percent of the population) still live below the poverty line. When taking the train, part of me would like to photograph the dirt-covered, barefooted children asleep on newspapers or the train door frozen from the inside as passengers are left to deal with the icy temperatures of the North (-37°C). But feeling intrusive, I refrain. Do you also feel self-conscious in Asia? It’s difficult being subtle, given the colour of my hair and skin, and the stamp on my passport. Noticing me walking the streets of China, many Chinese will assume, quite rightly, that I am Western but quite wrongly that I must therefore have dollar bills rolling from my body like a central bank printing press. Often I do not wish to fuel their prejudices by whipping out a digital camera, however small, before their eyes. As a resident in Thailand, I can empathize with those views, especially the general Asian misconception that all Westerners are rich. Although this can be annoying, I do believe these views are changing for the better, as the younger generation becomes more socially aware through travel and better education. Now let’s turn to the technical stuff. Some of our readers may want to know what kind of camera and lenses you use. I have a small Samsung camera that fits neatly in the palm of my hand. It’s nothing fancy and often leaves something to be desired in terms of quality, but it was a birthday gift years ago and has sentimental value, having been my only travel partner across unknown lands. 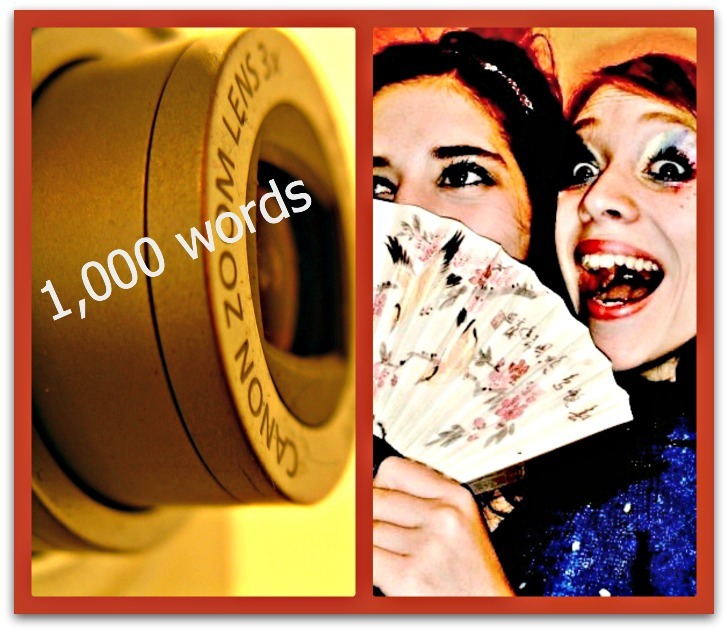 Whatever it lacks in lens quality, Windows Photo Gallery makes up for in magical editing power! Wander through villages, peel garlic with a farmer, shake hands with a prince, run through jungles, leap into waterfalls, swing across the rainforest wilderness and lose a leg to the marble rocks—see the world and allow the world to be seen. Travel, live, eternalize what you see with a photo. Great non-technical advice, Rachel, that’s right up my street! I’d like to thank you for taking the time to tell your fascinating story in this interview. Readers, what do you make of Rachel’s experiences and her photography advice? And do you have any questions for her on her photos or her travels? Please leave them in the comments! And if you want to know more about Rachel Kanev, don’t forget to visit her blog, Globe Drifting. You can also follow her on Twitter or even shoot her an email. The enthusiasm of my subjects in the TDN interviews has made doing this series a real pleasure. There are so many interesting people out there exploring the world, themselves and capturing their experiences in camera. If you are one of them I’d love to hear your story. 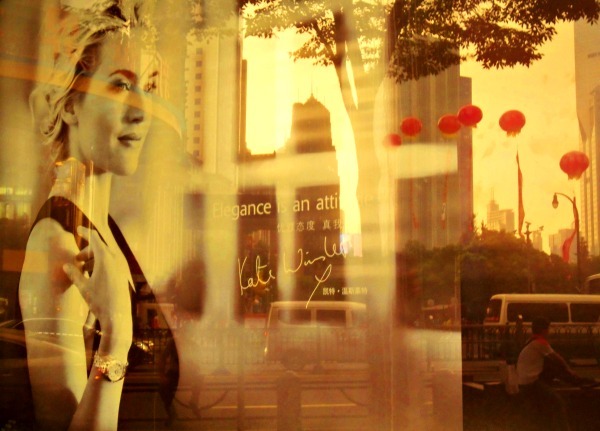 “A picture says…”, series for The Displaced Nation, which is edited by series host English expat, blogger, writer, world traveler and photography enthusiast James King, who thinks of a camera as a mirror with memory. Hi Rachel, I am currently a graduate student researching and developing an Art Education curriculum for Third Culture Kids. If possible, I am interested in your work and travels as a TCK artist and how life as a TCK has influenced your photography. Is it possible to contact you personally? Thank you so much for sharing your life and your work with us! Thank you for this stellar interview. A smile has spread across my face and a twinkle shines in my eyes. Marvelous! Liked your travel comments about ” the new and unknown… the errant wanderer …revels in the present.” It is experiencing separate realities in this same world, but living entirely different life-styIes that lets us recapture the wonderment of childhood discoveries.